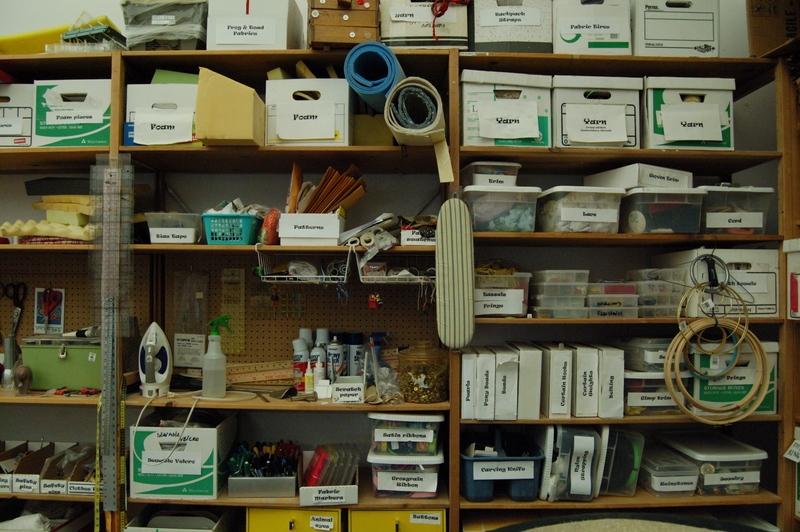 The San Francisco Opera goes behind the scenes into the prop shop with prop master Lori Harrison in this video. Find out how they make fake weapons and giant cotton candy, the hallmarks of any good opera. We have a bit of a break during the summer at Triad Stage between when the last show opens and the new season begins. It’s the time we spend cleaning and organizing the shops. We’ve been busy in the props shop doing a pretty big overhaul with building new shelving and storage spaces, and moving around where things go. 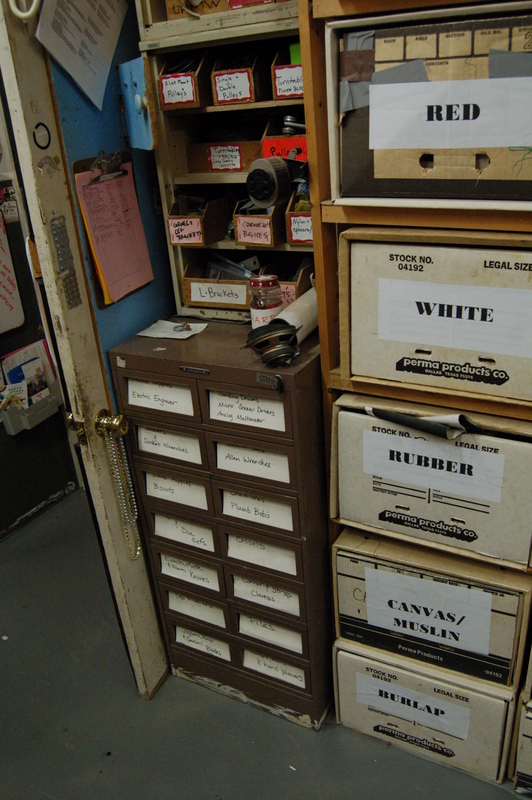 Organizing a props shop can be a challenge, since props people want to save every bit and scrap they come across. I thought I’d share some pictures of various shops I’ve been in to show how others have tackled this problem. The first picture is actually from the scene shop at ACT in San Francisco, but props shops need to store and organize hardware as well. 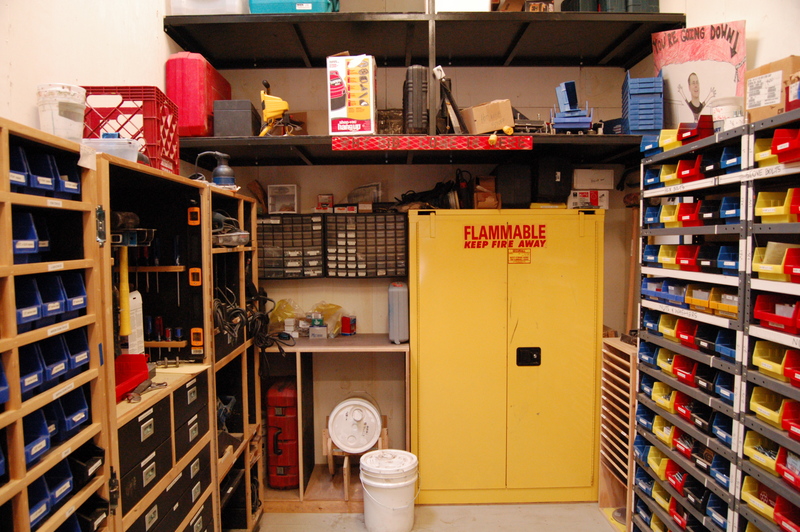 It’s pricey way to store things, with tons of metal shelving and matching bins. But it allows everything to be separated out while allowing you to find anything just by visually scanning the room; nothing is tucked away. Childsplay Theater in Arizona uses the full wall approach, where a whole wall is covered in shelving from floor to ceiling and filled with bins. You can see boxes and bins of all sizes, as well as plastic tubs, baskets, and loose items. It’s very modular, allowing one to change what is stored there if you run out of one type of material and decide not to reorder it. It also has the benefit of displaying everything you have available without hiding anything away. 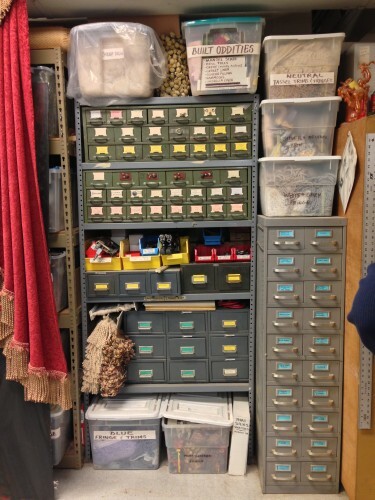 The Berkeley Rep props shop takes full advantage of using every square inch of their tiny props shop. A mix of open shelves, bins and drawers fill every hole in the wall. Various cabinets and shelving units are tucked in every corner to keep every spare area utilized. 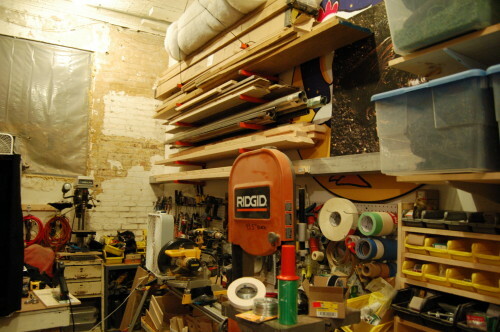 I’ve found that if you don’t designate uses for all the out-of-the-way areas of a shop, they end up accumulating piles of random items and scraps in a big heap. Likewise, if you don’t have a bin or shelf to put a thing away in, then it will always be in the way, and you will always be moving it around. 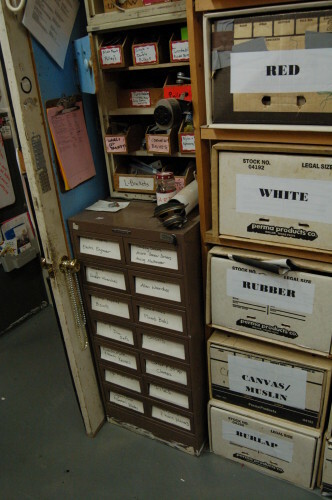 Here is part of a shop of a Broadway prop maker in New York City. He is also using the “every square inch” approach in his tiny shop, though he has opted to keep everything out in the open, rather than in bins and boxes. 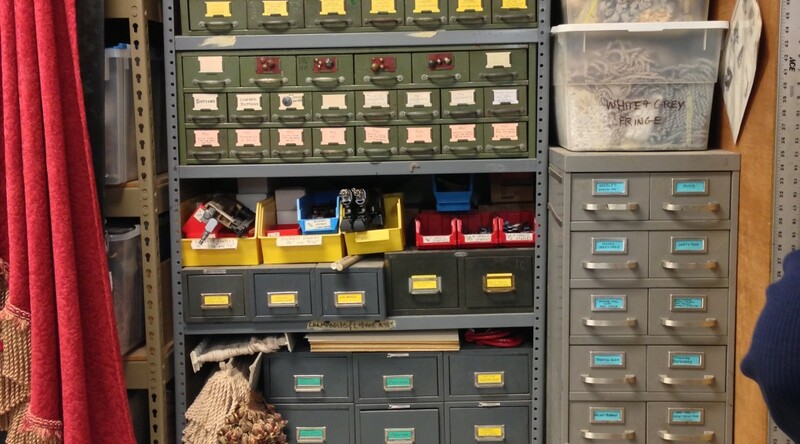 Props shops seem to naturally accumulate little metal file box cabinets over the years, and Milwaukee Rep has put them to good use. 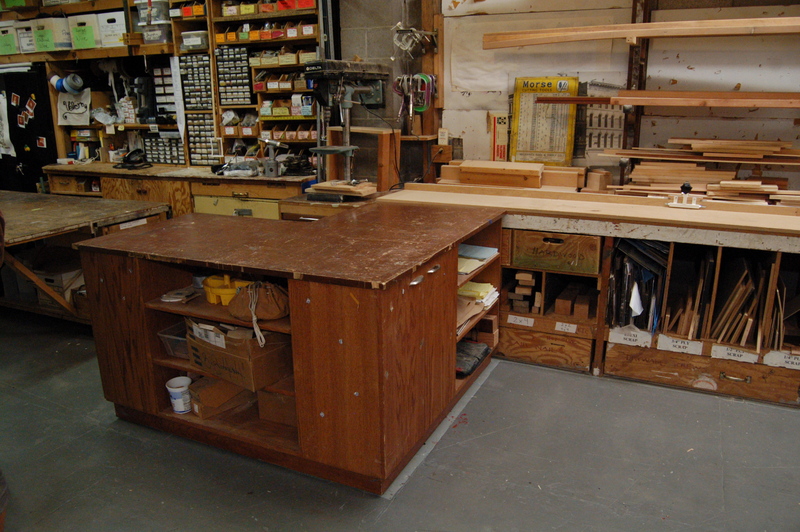 With bins, you can carry the whole bin to wherever you need it in the shop, whereas with drawers, a prop maker doesn’t have to hunt down a missing bin that someone else has taken. 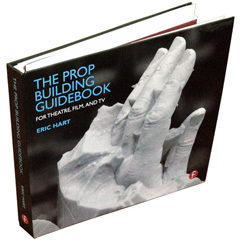 It’s a matter of preference which you use, though many prop shops have a mix of both. 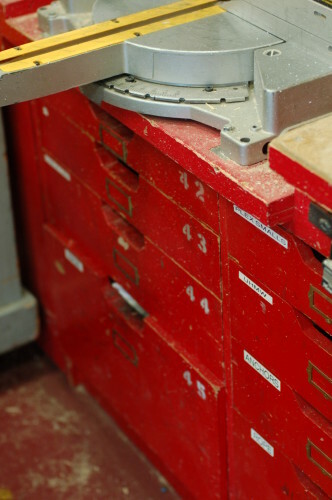 I liked these drawers underneath the chop saw in the San Francisco Opera. Adding storage under tools and machines is a great way to use space, especially if you can store the materials and equipment associated with that tool. The tool and hardware cabinet at the Public Theater was in a weird area, so a custom storage area was built by the shop. The angle in that corner was not square, and the walls sloped backwards as well, so any ready-made shelving or storage units would end up wasting precious space. 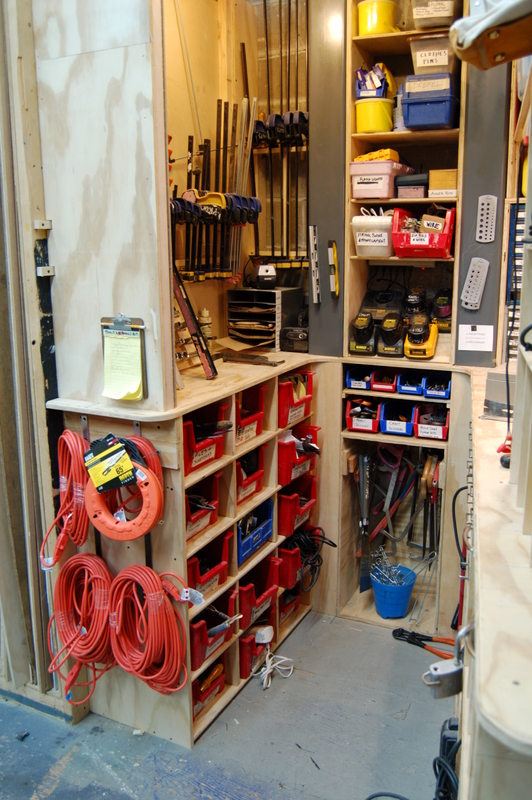 Here is the opposite side of the Public’s tool cabinet. With the right organization and storage, a shop can hold more tools, materials and supplies, and yet have more open working space than a poorly organized one. 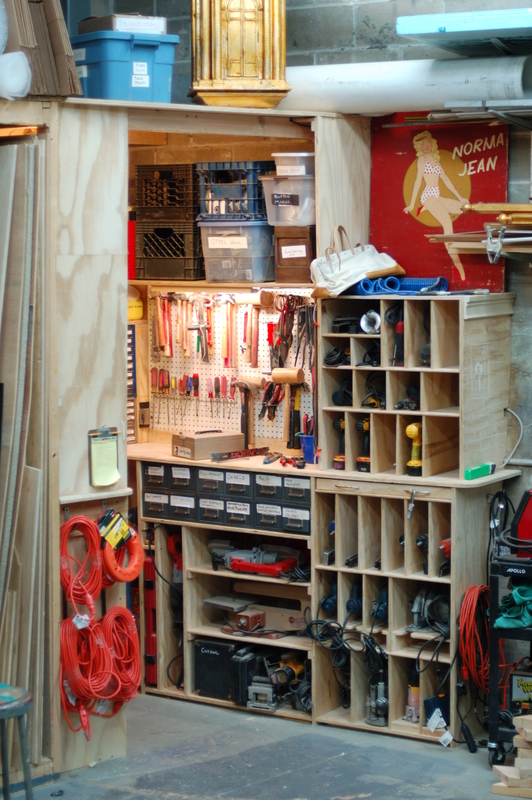 How is your shop organized? I’d love to see pictures. Send them my way. The weekend is upon us again. It’s a holiday weekend; for those of us in the theatre, that means we have to go to work despite all the stores and banks being closed. It is also the unofficial end of summer. But don’t worry; I have some fun links below! Curtains without Borders is a fascinating-looking project. It aims to record and restore all those hand painted theatre curtains found in town halls, grange halls, theaters and opera houses. It is mostly preserving those painted between 1890 through 1940. The site itself has some photographs (albeit of a small size) from across the country showcasing these valuable pieces of our theatrical history. 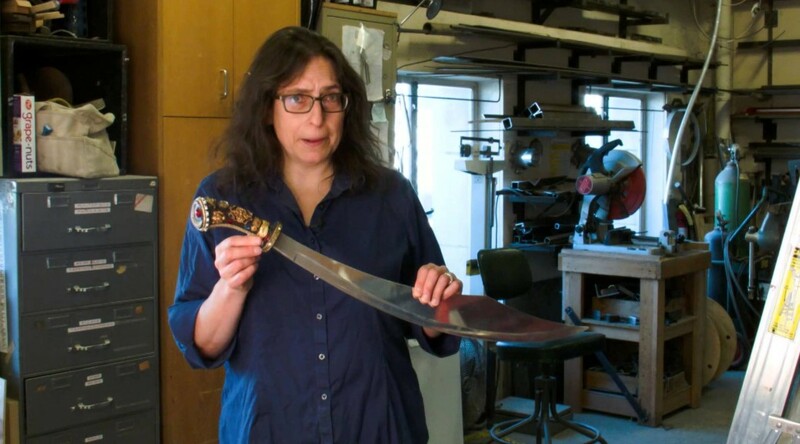 The San Francisco Gate has an article about Lori Harrison, the prop master at the San Francisco Opera. Lori gave us a tour of the opera back in 2010 when SPAM held its conference out there. LA Weekly has a short blog asking “what do you do when your gun doesn’t go off onstage?” Most prop masters know to incorporate backup plans whenever dealing with firing blanks on stage, but if you don’t, this article is a good reminder that you should. The National Park Service just completed a huge project. Thousands of images from their collections across the country are searchable and viewable online. These objects and specimens give a wide range of information from America’s history and are great for research. Here are some pretty cool vintage ammo boxes. Unfortunately, none of the images are dated, but the enterprising prop master might be able to use them for further research. And while we’re at it, the whole Accidental Mysteries blog where this came from is filled with interesting vintage stuff and historic oddities.